Tomorrow my neighbors’ houses on Bayview Road at Money Island NJ will be torn down by a state contractor. Hardly a day goes by when someone doesn’t ask me “Why?” Yet even with as many times as I had to respond to this question, I still don’t have a neat concise answer. More disturbing, I don’t have an answer that I really believe. Some former homeowners here would say they were unable to handle the high costs associated with rising water levels. Others, like our mayor, call it “NJDEP terrorism” as the state threatened massive fines against us without offering any source of funds to address the new environmental challenges. At least a few of my former neighbors would say they were just scared away by what they saw happening around them. I still wonder about the thought process that went into my neighbors’ thinking about selling and moving out that caused them to act differently when negotiating with the state compared to what they told me in person when we talked last. I was surprised and apparently the local government was equally surprised that 100% of the neighbors across the bridge elected to sell their properties. The overall buyout completion rate is 80%, according to NJ Blue Acres office, indicating that normally a few houses remain after a buyout. It might have had to do with the bridge itself that was badly corroded and appeared to be collapsing prior to the buyouts. Ironically, the bridge repair and seawall construction were completed after the buyouts were planned. No doubt this is am emotional and sad time for many. Looking at the photos, I think of the happy times I’ve had as a guest in many of these neighbors houses in earlier times. I also think of the few neighbors who later blamed me for causing the state to acquire these houses. I try to not think too much about the bizarre events that led to death threats and even an attempt on my life by an angry neighbor and a politician for my role in trying to preserve this community. After tomorrow only two houses will be left on Bayview road. My home office is one of the two and this site is proposed as a research/educational facility for the future. The only reason these two properties were spared the devastating impact of higher and more violent wave action is because we are protected by a half million dollar sea wall, sand berms, and more sturdy pilings that elevate the buildings. Many other questions come up at a time like this. Is the state’s strategic retreat policy sound? (Surely we can’t afford to relocate our entire New Jersey coastal population inland!) Will we be besieged by another round of ‘disaster tourists’ after the tear downs (like after Sandy)? Or will the area’s use as a nature preserve bring positive change? Will the state step up it’s legal harassment against the two remaining homeowners? How will we cope with wilder wetter weather and the flooding ahead? What physical accommodations will be necessary to accommodate higher water levels and more damaging erosion? Will my floating barge-based infrastructure construction designs gradually become accepted under state regulations or will I continue to clash with the older dry land building codes? We just do not know the answers to these questions yet. We do know that the future of Money Island is bright. 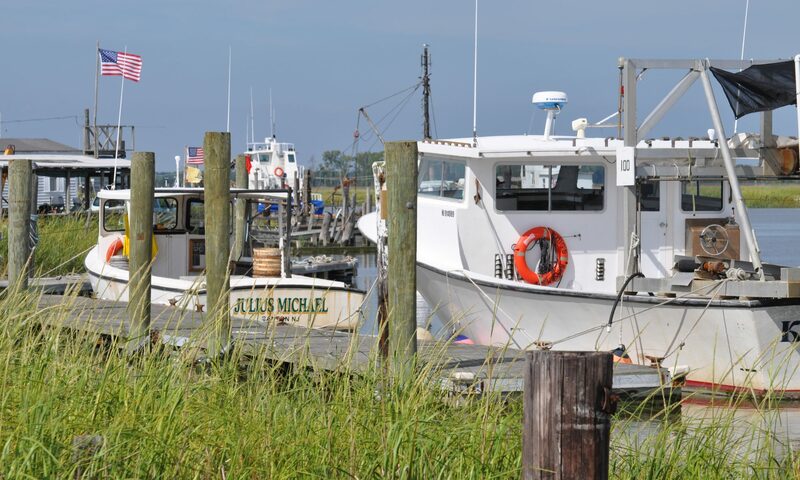 It is the region’s second most productive seafood landing port. The local seafood industry is now entering a significant growth phase based on new technology and changing water conditions. Money Island remains an important research and recreational spot. Millions of dollars are being spent here to sustain and redevelop the area in a sustainable future. We also know that we won’t be the last residential community to grapple with these strategic retreat questions related to the removal of homes. I just wish we weren’t among the first to have to figure out where to go from here. This photograph of a cabin taken in 2017 shows part of a former residence constructed on dry land decades ago that was consumed by sea level rise and storms, and is now completely removed. Almost 100% of the lot is now below mean high tide line and the state has acquired the property for open space. For anyone considering witnessing the demolition tomorrow: be careful. We may have severe flooding around noon that would be deep enough to damage a car. planned to be there but changed my mind after working in knee-deep water for several hours today.